Base Unit with 2 pan drawers. 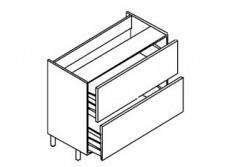 Requires 2 drawer fronts 355mm high. BLUM Soft Close option available. Can be colour co-ordinated at no extra cost.